The search is over, and you’ve accepted a new role. Congratulations! If that doesn’t apply to you now, it soon will. And once it does, a whole new exciting process begins: transitioning from graduate school to your new job. 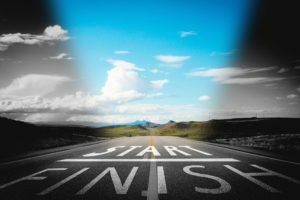 Whether that is in academia, industry, government, or otherwise, there are a few strategies you can use to successfully begin the next chapter of your career. First, check to see if your new organization will be providing you with any kind of formal mentor during the first year or 90 days? Someone who can help ease your transition, particularly to the sociocultural norms of your new organization and city. If not, seek one out on your own. 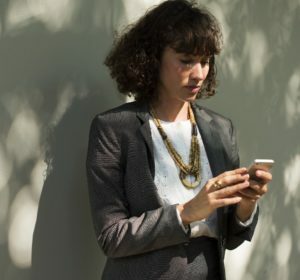 Part of your supervisor’s support could be in facilitating the connection to someone who would be willing and interested to meet with you a few times as you get settled into your role. Check out the articles pinned on the “Career Advice & Inspiration” board of our Pinterest page for more tips on launching a successful career. Moving to an unfamiliar city can be daunting as well. Notre Dame provides many opportunities for social support that might be missed once you leave campus. Finding a similar network will be important for replacing those support systems. In an example where you might be moving to Baltimore, you could seek out local young professional groups, or if you enjoy running and fitness you could look into the Baltimore November Project club as a way to meet new people. Another resource you can access while you’re still on campus is GoinGlobal. One of the best features of GoinGlobal are the “City Guides,” and they have guides for 47 U.S. cities from Albuquerque to Washington DC. Moving abroad? There are business and cultural guides for 41 Countries and 32 international cities. As long as you’re connected to the ND internet (or proxied into the library databases) you can utilize our campus subscription. You can find it down in the list of employer databases on this page of our website. Finally, don’t forget about the Notre Dame Alumni Clubs as a fantastic way of staying connected to friendly faces. Please add your own tips for transitioning to a new organization and city in the comments below. Want to plan a personalized strategy for your unique situation? Schedule an appointment with your graduate career consultant today! When it comes to references, the best practice is to use people who have seen your work (and work ethic and professionalism etc.) in action. It’s really nice if they can speak to your directly related skills and experiences, but if you are pivoting that may not be available. They’ll ideally be able to share personal stories of your successes, but at a minimum can confirm that you show up to work on time, come prepared, make productive contributions to the organization, are a pleasant individual, know your stuff, etc. Professors and PIs work well for current students, as they can attest to your field-specific skills, initiative, preparedness, etc. Working professionals should try to think of other folks at the organization with whom you have had productive working relationships. They could be project managers from teams who relied on your support or contributions, or people at client organizations with whom you have had numerous (positive) professional interactions. If you left a previous job or program on good terms, perhaps someone from that organization would be willing to be a reference. Are you involved in any professional or civic associations? When I applied to my role here at ND I had been on the leadership team for our professional consortium. In addition to my direct supervisor, two of my three professional references came from other members of that leadership team, since I had worked closely with them on a number of initiatives over the recent years. If you completed research or a capstone project with individuals at external organizations, think of someone from that experience who could potentially be a reference. Professional references should never include family members, and there’s no need to include friends or clergy as “character” references. Additional information about references can be found on this page of our website. A note about formatting: Use the same format for your name and contact info at the top of your references page as you use on your resume. And proofread the formatting of each reference listing to make sure things like phone numbers and e-mail addresses are formatted consistently. Finally: I encourage you to add LinkedIn recommendations to your profile. If someone writes 3-4 sentences about what a great job you did on a project or in their class, other employers will see you as a valuable addition to their team. Just like endorsements, the fastest way to get recommended is to recommend the work of others. While endorsed skills help you appear in employer search results, recommendations hold more value in the eye of actual readers because those people took the time to sit down and write a few sentences rather than simply pushing a button. NOTE: I want to emphasize that these are short, 3-4 sentence, recommendations, definitely not an entire letter of recommendation or anything like that. I have a number of recommendations on my profile if you want to see what they look like. If someone writes you a glowing LinkedIn recommendation with the right context, then perhaps you could ask them to also be a professional reference for you during your search. The fastest way to get recommended on LinkedIn is to write recommendations for other people. Often they will want to reciprocate. Have you found other successful references from other sources? Please share in the comments. A student reached out to us recently for tips on interviewing over lunch. 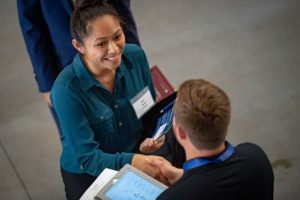 As the fall recruiting season reaches the point where on-site interviews will become more common, and in preparation for the academic flyouts in the winter, here are some tips for successful interviews that take place over lunch or dinner. 1) The meal is definitely still part of the interview process. While you likely will have the chance to ask questions, your interviewers or search committee will probably dig deeper into how you fit with the team and what you bring to the role. Part of that process is gauging how well you get along with everyone at the table, how smoothly the conversation goes, and how at ease they feel with you as a member of their group. They’ll be making sure they’d want to have more lunch meetings with you in the future, so try to feel like you’re part of the team. 2) Should I get the lobster? If they say they’re taking you to a restaurant that has the best lobster in town, that’s your cue to get the lobster if you want. Otherwise, don’t get something too expensive. Order from the “middle of the menu.” Not physically the middle, but in terms of price range. 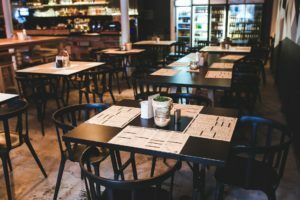 Don’t feel like you have to order the least expensive menu item just to show you’re being sensitive to their budget, but don’t order the most expensive thing either. 4) Take SMALL BITES of food. Inevitably someone will ask you a question as soon as you take a big bite of food, and then everyone will wait awkwardly while you chew and swallow as fast as possible. 🙂 Taking small bites will speed up that process. 5) Absolutely avoid anything messy. If they take you to a sandwich place, it’s ok to get a sandwich that requires use of your hands, but it shouldn’t be so saucy that it runs all over your fingers or drips down your chin. Also avoid things that can splatter your clothes like pasta. Good options generally include a fancy salad (rather than just a basic house salad…see #2 above), a skillet style dish that you eat with a knife and fork, or a sandwich wrap that would stay contained better than bread or bun sandwiches whose ingredients can spill out the back. And again, small bites. If you get something like a chicken salad wrap, it can be helpful to eat about 50% of the “guts” first with your fork, then either continue with your fork or pick up the wrap with its more manageable amount of filling that won’t spill out as easily. Ultimately you want them paying attention to what you’re saying and how they feel having you around for a lunch meeting. Ideally they won’t even notice that you’re eating because it will be seamless, but you do have to eat so hopefully the above steps will help you avoid some of the common pitfalls of the meal interview. 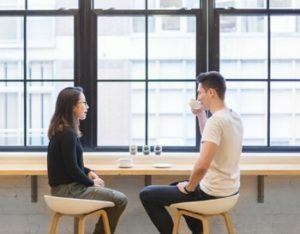 If you’re not just meeting at the restaurant and you have the chance to see the office space itself, this Forbes article provides tips on what to look for around the office. Don’t worry about every minor piece of “proper” dining etiquette (there are far too many to keep them all straight), but this article offers a pretty succinct list of good ones. What other tips do you have for interviews over lunch and dinner? What has worked well for you in the past? 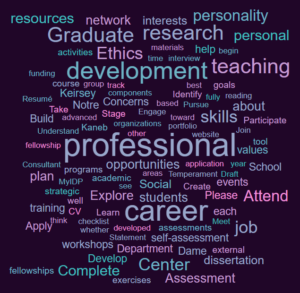 If you have any questions or concerns, consider scheduling an appointment with your Graduate Career Consultant. Today’s post comes from our new Director of Graduate Career Services, Rob Coloney. Welcome (back, should it apply to you) to the University of Notre Dame! Since 1842, the campus has always been most exciting when you, our students, grace it with your presence. Like some of you, I am new to the Notre Dame family; joining the Fighting Irish family after spending my entire life in the Northeast. It is my distinct privilege and honor to serve as the new Director of Graduate Career Services. Get Comfortable Being Uncomfortable. Allow yourself to be challenged. Go beyond the realms of where you’ve ventured before. Say “YES,” more than you say “NO.” By allowing yourself to experience all that the University has to offer, you will be immersing yourself in the tremendous educational opportunity you’ve afforded yourself through your tireless effort and work to this point. To give anything less than your best is to sacrifice your innate gift; experience everything. Find a Sherpa. No one would dare climb to the top of Mount Everest without one. In turn, no one is expecting you to navigate a challenging journey alone. Find a mentor, administrator, staff member, faculty member, or better yet, all of the above. Ask questions! Graduate School is challenging, but we’re all in this mission together. We want you to succeed, and want to ensure you have every tool available to you in order to make that dream a reality. 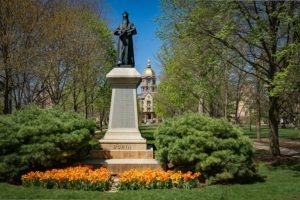 Since 1842, the University of Notre Dame has held true to those incredibly powerful words. Now, YOU are tasked with continuing the mission. I encourage you to take advantage of this very special place – we are lucky to have you, and cannot wait to work with you on achieving your dreams, and realizing your full potential. Your Research Matters. You Matter. Be a Force for Good. 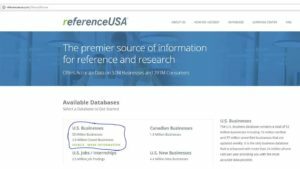 One of my favorite resources is a database called ReferenceUSA. I’ve been telling so many students about it during one-on-one consultations recently that I thought a blog post might come in handy. Visit www.referenceusa.com (NOTE: You must be connected to the ND network or use off-campus proxy access like any other ND library database). Click the “U.S. Businesses” link (see screenshot above), and then the “advanced search” tab. In the search bar that comes up, search for different keywords related to your interests, and select the related fields that pop up. You should be able to select as many different ones as you want, and some of them can get very specific/niche. Note: the “industries” are based on what the company does, not on what the job would be. You might have the opportunity to do communications-based work at a company that manufactures engines, for example. Think of the contexts you would enjoy writing about. Advanced tip: start with a quick search and look up a company you know you’d want to work for. See how the database classifies them through the SIC or NAICS codes. Then use those codes rather than keywords for your advanced search. After you’ve selected your industries, go back to the submenu on the left and expand “Geography.” Select the geography type that fits you best, and define your geographic search parameters. If you’re open to relocating anywhere in the country, don’t feel obligated to narrow it down geographically, I’m just offering it as a suggestion. You could also do a few different places, like all of Indiana, and part of Chicago. If you want to preview how many results you will have, click the blue “update count” button first. That can tell you if you need to narrow or widen your search parameters. You can also narrow the results by size of company (# of employees). Once you’ve got your fields and locations, click the green “view results” button on the upper right. On the results page, you can simply click the name of the company to learn more about that company. The database has a lot of information, but it’s not infallible. If you don’t see a website listed, for example, just google the company. Chances are they actually do have a website. To download your results to excel, click the blue “download” button at the top of the results page. You can download up to 100 results at a time, and go back for the next 100 after each download. The only kind of downloading I have done is to excel, but you can do the others if you prefer. If you find a company you like, look at their “industry profile.” You can use the SIC codes to look for similar companies in step #3 above in lieu of keywords. Have you used ReferenceUSA yet? Any other great resources you have found? Share your stories in the comments below. Today’s blog post was written by Larry Milks, Graduate Career Consultant for the College of Engineering. 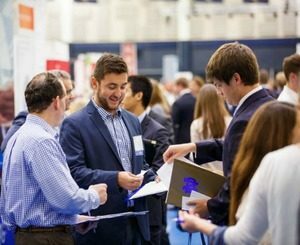 Whether you are a 1st year grad student looking for an internship, or a 5th year student approaching the last stages of degree completion, or somewhere in between, at some point you will face the sometimes daunting challenge of seeking meaningful employment among scarce options in a highly competitive environment. So how can you set yourself apart and stand out from the crowd? How can you gain a competitive advantage? The answer is NETWORKING! Forbes senior editor Susan Adams cites data that show 42% of 59,133 job seekers obtained their position as a result of networking. The next highest source of obtaining work was internet job boards at 21%. Networking is twice as productive as job boards in this survey and far more effective than any other single job search strategy such as using a search agency or online system. However, as I talk with students I find that many are reluctant to network and find it a bit intimidating, particularly when they are considering asking for an informational interview, perhaps the richest form of networking. They have some fear that they will be rejected, that the person they reach out to won’t have time for them or even want to talk with them. Others are not really sure how to go about it. So be encouraged, you are not alone, and there are good antidotes to these issues. First, consider for a moment that an undergrad in your department approached you with something like this. I’m quite sure that most of you would be happy to help out such an earnest and thoughtful student who is interested in considering the path you have taken. You would probably even find it rewarding to be able to share a bit from your life with a younger student. You would also likely be quite supportive and speak positively with your DGS if they did apply in the future. If you had pressing deadlines at the moment, then you would politely decline the student’s request, but likely you would have an idea of someone else who could help. Alternatively, you might just suggest a delay in the meeting to accommodate your schedule. Now reverse the roles, and realize that those people you would like to do an informational interview with will generally want to be helpful, just like you would be for the undergraduate. When they understand you are not asking them for a job, but seeking to understand their career area and how to best prepare for a move in that direction, they might even be honored that you asked them. They will also remember you when a future position becomes available in their organization. In my own recent job search this past year I reached out to 8 different college career advisors. These were all cold call emails with no one to introduce me to them first. I received “yes” responses from 4 of these 8! Imagine the improved response rate that you will get if you can find a bridge person to introduce you to the individual you hope to interview! Irish Compass is a great resource which can connect you with ND alumni who have already agreed to do informational interviews for ND students! Additionally, they could possibly be a bridge person who introduces you to the individual at their company who would be a perfect fit for an informational interview given your specific needs. So be bold! Reach out! You have nothing to lose and much to gain! Do you have a story to tell about how networking has worked for you? Please share below!